If you’re short on space or looking to erase visual clutter, opt for a multipurpose wall bed that hides away. Sky-high rental and mortgage rates in many of today’s most sought-after cities, along with an increased desire for thoughtful, curated, eco-conscious living have driven many to live in small spaces and tiny homes. But with these shrinking spaces comes the need for multipurpose furniture that allows homeowners to use one room for lots of different functions. Some small-space design trends in recent years include using wall space for a variety of functions, like wall-mounted, drop-leaf dining tables and fancy built-ins to maximize storage. Another clever way to utilize wall space in a small dwelling is the tried-and-true Murphy bed. Read on to learn more about this clever design feature, and see some of our favorite Murphy bed design ideas to spark ideas about how to incorporate one into your own space. In this living area, a built-in Murphy bed can be pulled down to create a flexible sleeping area when needed. This Murphy bed incorporates two small bedside nooks with built-in lighting. First of all, what is a Murphy bed? Also known as a wall bed or hideaway bed, a Murphy bed, named after its inventor—also a small-space dweller—is a bed that folds into the wall (or a cabinet) when not in use. This allows for more space that can be used for a variety of other functions aside from sleeping. Despite their early beginnings as just a fold-up bed, today’s Murphy beds are becoming even more functional, often incorporating a desk or even a couch underneath, which can be used when the bed is stowed away. Those who are weighing their options often wonder, is a Murphy bed comfortable? Thankfully, because Murphy beds use standard bed mattresses (unlike sofa beds), they’re quite supportive and cozy. In fact, some homeowners opt to install Murphy beds in their guest rooms even when they aren’t short on space. If comfort is a deciding factor when choosing between a wall bed and a sofa bed, the wall bed will likely come out on top. Murphy beds make a great sleeping option, regardless of your situation. Here, the cleverly planned living area may look small, but can sleep as many as four guests on two sleep sofas and a double Murphy bed on the other side of the partition. On top of it all, Murphy beds are fairly affordable. No matter what your budget, you can find a Murphy bed that works for you. 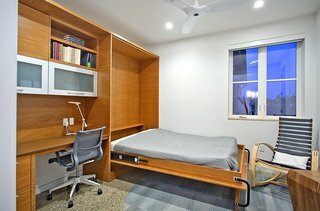 From a basic DIY Murphy frame to a luxe, multi-unit Murphy bed with a couch and shelving underneath, prices vary when it comes to the average cost of a Murphy bed. A complete Murphy bed typically retails between $2,000 and $3,000. Expect to pay slightly less for a basic model, and a bit more if you're looking for upgraded options like lighting, storage, and surrounding cabinetry. If that's a bit outside your budget, consider a Murphy bed kit like these DIY Lori Wall Beds. The kit and plans can be purchased for less than $200. A common trend among modern Murphy beds is to fold into a cabinet. 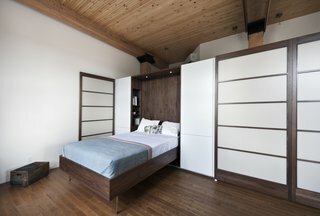 By lowering the custom Murphy bed and rolling a sliding plywood door, this homeowner creates an instant guest room. And the good news is, you probably won’t have to buy a new mattress. Most Murphy beds can accommodate a mattress up to 12 inches thick, while the standard Murphy bed mattress is 10 inches. A mattress of this size will easily fold into the bed’s frame, along with most bedding and pillows. If you use an extra-thick comforter, have lots of blankets, or decorate your bed with a variety of decorative pillows, these may need to be stored separately in order to ensure the Murphy bed closes properly. This peaceful, rustic bedroom makes use of a Murphy bed by Resource Furniture with a couch in a three- or two-seat version and integrates with closet and shelving systems. Despite their folding design and the fact that they can be raised and lowered easily, Murphy beds are quite sturdy. Most models can hold at least 1,000 pounds, while Murphy bed manufacturer Wall Beds by Wilding boasts their Murphy beds can hold a staggering 4,000 pounds. But what about size? Are you wondering if you’ll be able to fit a wall bed into your space? The Bedder Way company supplies the following basic dimensions you may need based on the size of bed you're looking to buy. 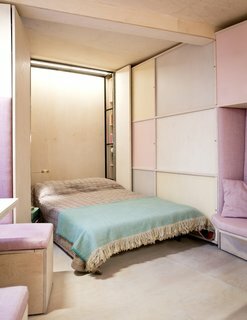 In this tiny Italian apartment, one of the wall panels is a Murphy bed that folds up when not in use. 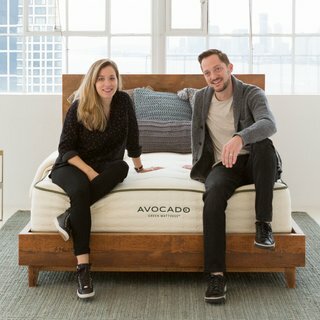 Our Green Mattress features 100% natural latex foam, 100% GOTS organic certified wool, 100% GOTS organic certified cotton and up to 1,414 pocketed support coils in 3 zones plus a reinforced perimeter. Hand tufted and assembled in Los Angeles. No polyurethane foams or toxic fire retardants. The FLÖNG bedding set by IKEA features a blue and white geometric pattern, and includes one Full/Queen duvet cover and two pillowcases. 104 thread count. Modern Murphy beds cleverly marry form and function. This Murphy bed with couch also features a shelf at the foot of the bed that doubles as decor and handy storage. Here's the bed transitioned from day mode to sleep mode. Here's another amazing multipurpose wall bed by Resource Furniture. It's a Murphy bed with couch, coffee table, and storage shelf. In the down position, it fits neatly over the Como Basso, a tempered glass coffee table on casters. 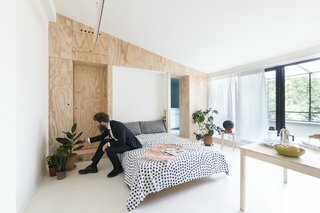 A vertical Murphy bed fits perfectly into a narrow space in this triangular apartment. Here, a cabinet runs along the entire back wall of the den, incorporating a Murphy bed with desk, task lighting, and even ample storage space for belongings. By pulling down the Murphy bed, the den becomes a guest room. Wall beds can be oriented either vertically or horizontally. This home office doubles as a guest room thanks to a vertical Murphy bed that folds down to reveal shelves stocked with magazines. "We wanted to keep the exterior walls uncluttered, so you can focus on the views, the light, and the air," says Rosa Garneau, the owner of a 650-square-foot co-op in New York's Chelsea neighborhood. 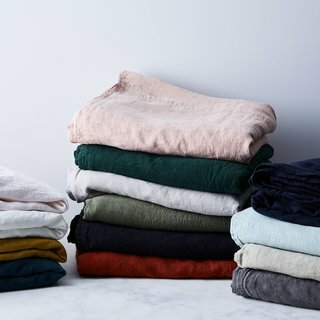 To achieve a clean look, everything gets tucked away, including the mattress and bedding. When looking for the best Murphy bed, look for one that can accommodate basic bedding without having to remove and store it daily. 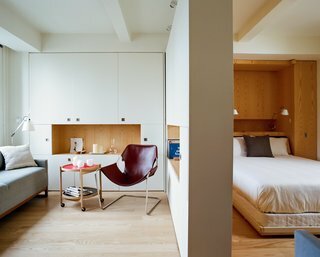 In an 850-square-foot loft in Montreal, Quebec–based firm Gepetto built understated, custom cabinetry to suit an aging couple's needs. Here, the Murphy bed that folds into a larger walnut storage unit. The wall, which also conceals a washer and dryer, does double duty as a partition between the bedroom and the loft’s entrance. Modern Murphy beds like this one often incorporate sleek lines constructed in dark-toned woods. 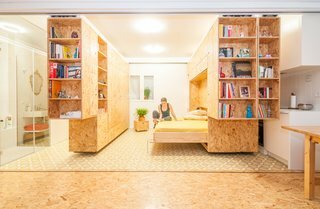 Madrid-based firm PKMN dreamed up this flexible concept for a client with a tiny home north of the city. Made up of three shelving units on track system, the All I Own House can be configured in countless ways, making space for a bedroom, kitchen, sitting area, changing room, and more. Shown here is a horizontal Murphy bed, which makes a great space-saving solution as well as a comfortable sleeping space. 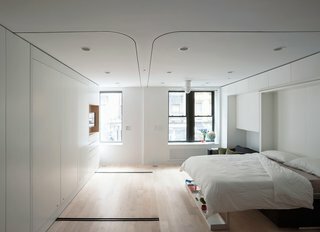 "I think of the bed as intimate space, and putting the bed away—having it out of sight when not in use—is satisfying," says Milan Hughston, who reconfigured his West Village apartment with the help of architect Joel Sanders. This custom-designed Murphy bed, concealed by day behind the gold curtain, is well built; it's ergonomically easy to lower and has a firm sleeping surface. Furniture designer Pat Carson created a plethora of custom fixtures for this guest room, including a riveted aluminum Murphy bed. The best Murphy beds raise and lower easily, often requiring only one hand. This unique wall bed employs a hand-cranked wheel-and-pulley system. 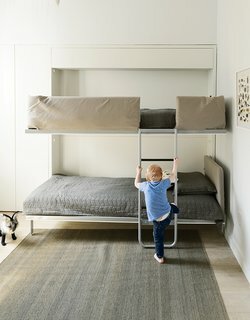 This Murphy bunk bed, the Lollipop IN model from Resource Furniture, stows away flush to the wall when not in use. 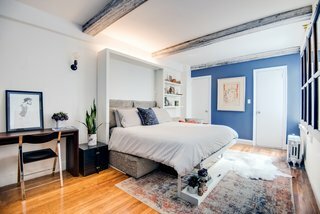 Related Reading: 11 Hidden Beds in Small Homes, Sofa Bed Versus Wall Bed: What’s Best For Your Small Space?